I’m not a huge fan of sagas and series’ when it comes to my own reading tastes but I love them for kids. Caterpillar seems to really enjoy revisiting familiar characters for a new adventure and the Dr Hedgehog books by Jerry Mushin are a fab example. 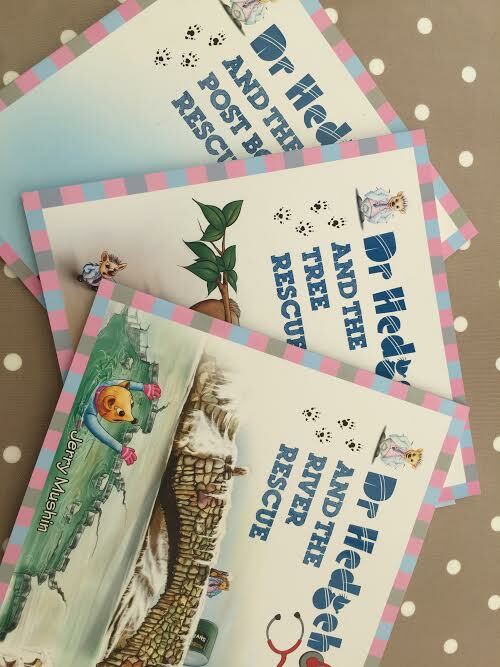 Dr Hedgehog is a great central character – less of a doctor and more of an emergency service if the three books we’ve read are anything to go by – Dr Hedgehog & The Tree Rescue, Dr Hedgehog & The River Rescue and Dr Hedgehog & The Post Box Rescue. What child doesn’t like a rescue and adventure story? Each book includes recurring characters, in addition to our protagonist, including Martin Mouse who is forever getting into sticky situations and his long suffering mum. Dr Hedgehog isn’t you’re typical hero – with shiny gadgets and a impressive vehicle – in fact, he is very ordinary and drives around in an old baked bean tin (love the creativity of this). To be honest, he is downright grumpy and impatient at times, and that’s actually what we love about him as he provides great humour. A particular highlight is when Dr Hedgehog throws a sandwich to Martin Mouse when he is stuck in the river because he must be hungry! Each book revolves around a rescue story which really captured Caterpillar’s attention. The illustrations, font and the style of language really reminded me of my own childhood stories from the 80s and we really enjoyed the creative touches and vivid descriptions (“Martin Mouse could hear the sound of its engine. Rackety-Tickety-Tackety-Tock!“). As an added bonus each book comes with an extra large poster in the back which Caterpillar really enjoyed. If you’re looking for adventure stories a little different from the norm then check out Dr Hedgehog at Sweet Cherry Publishing. I’m already intrigued to read these stories after hearing about Dr. Hedgehog driving around in a baked bean tin. That would definitely make my daughter laugh! These sound like great fun. Dr Hedgehog reminds me a bit of Dr Martin off the telly – he’s very grumpy and seems to be a bit of a one man emergency service too! I’ve never tried reading a series with my grandson. This sounds like a good place to start. I’m sure he’d like Mr Hedgehog driving in a baked bean can lol. I’ve not heard of this series too but it looks great I will have to look out for it. Thanks for linking up to #kltr.